Oh, I just love the Chinese! I can't wait to visit China and get my hands on all their copied goods. First, during the height of the iPhone mania, some Chinese manufacturers released an iPhone clone and now, they actually jumped the gun on Sony and had released their own version of the PS3 Phone. Actually, news of this PS3 Phone has been around since May this year but I only started blogging this June. Anyways, Sony filed a patent for the PSP phone almost two weeks after the PS3 phone surfaced. Looks like Sony is trying to protect their patent. The design of the PS3 phone is not actually that bad. It really does look like a PSP (the black one, that is), the pink one just looks girly and doesn't really nearly resemble the PSP. 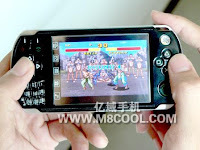 But the rip-off doesn't actually end at copying the PSP concept, the phone is from a company called Amycoll, ripoff of the Korean Anycall brand, the PS3 phone also has the windows logo, implying that it runs on a Windows OS but according to the mobilementalism, the OS itself is also fake. The Amycoll PS3 phone has emulators from Nintendo NES, SNES and GameBoy color so it can probably play your favorite ROMs. Though everything about this phone is fake, this is just SO cool, I mean from the gadget point of view that is. I mean I love my Windows Mobile Device and I just LOOVE my PSP so I'm probably going to ADORE a phone that combines the two. Though The Amycoll PS3 will probably won't see the light of day in the US, I think that I would probably see this baby popping up in my home country, the Philippines. The last time I was there, I saw the iPhone clone phone so the Amycoll PS3 will probably make it to the underground scene. I really hope that Sony will release their PSP phone soon. I mean, I've seen people blogging about the Amycoll PS3 and I'm sure while they're all laughing about how fake this phone is, I'm sure they're pretty blown away by the idea. So guys from Sony, if you're reading this, HURRY UP WITH THE PSP PHONE!